The Afsluitdijk, which connects North Holland and Friesland, is a world famous dike. Until in Seoul in 2010 the 33km long Saemangeumdijk was built, it was the largest dam in the world. On 28 May 1932 steam whistles and sirens sounded, and the flag was hoisted, as the Zuiderzee was no more. The dike was closed and the IJsselmeer (meer = lake) was born. On the Afsluitdijk there is a monument that commemorates the completion of the dam and closure of the Zuiderzee. Opposite this monument are information kiosks with information in several languages on the Zuiderzee (southern sea) Works, of which the Afsluitdijk is the result. There is also a bronze statue of a bricklayer depicting one of the workers from that era. The statue was unveiled on May 28, 1982, exactly 50 years after closure of the dike, by Queen Beatrix. Besides the historical significance and the impressive scale of this project, it is also just beautiful to look at, and even more so to experience the sea and the lake view while you are standing on the Afsluitdijk itself. 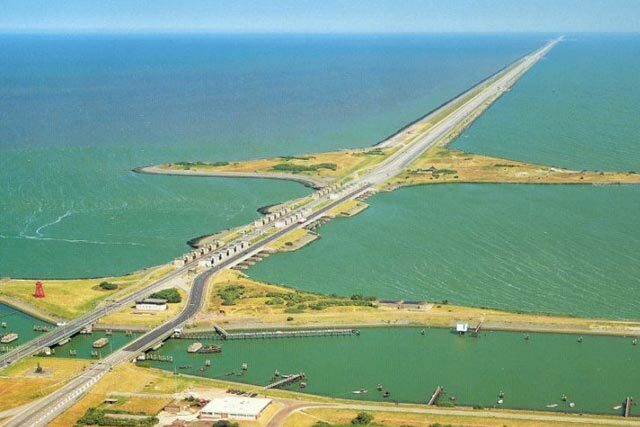 The Afsluitdijk is just 10 kilometers from Bed and Breakfast Oosterpark Harlingen. A visit is well worth it. The “Kazemattenmuseum” is 14 km away from Harlingen, on the Afsluitdijk, exit 14 nearby Kornwerderzand.